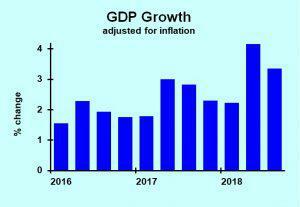 The U.S. economy grew at a solid pace in the fourth quarter, boding well for the outlook of this year and next. According to the delayed release of GDP data, the economy grew by 2.6 percent in the fourth quarter (after adjustment for seasonality and inflation, and computed at a compound annual rate). Although lower than the third quarter growth rate, it’s in line with the average of the last two years and better than preceding years. Despite gloomy headlines—and stock market performance—at the end of the year, it turns out that the economy was just fine. This growth came even though consumers were a bit conservative, having calmed down compared to the middle of 2018. The latest surveys show consumer attitudes deteriorated during the government shutdown but recovered thereafter. With solid job growth and continued wage gains, consumers will increase their spending at a moderate pace in 2019 and 2020, with some upside exuberance possible. Businesses bumped up their spending on equipment and software, as well as intellectual property development, last quarter. Capital spending had grown rapidly just after the tax reform of a year ago, then decelerated in the second and third quarters of 2018. Now companies are back in expansion mode. The tax changes help, as does continued need to add capacity, plus the benefits of automation and robotization in the continuing tight labor market. Look for continued gains, limited by some supply constraints on the hardware needed for more automation. Housing construction dropped last quarter, as it had throughout 2018. As I noted in “Housing Forecast: Not A Bubble In 2019, “I expect small declines in new housing construction in the coming years, but no bust.” Two factors will depress new construction this year and next. First, slow population growth. Last year’s increase in U.S. population was the lowest since 1937, significantly depressed by low foreign immigration into the country. Second, higher mortgage rates preclude some families from buying a home at this time. Neither of these will reverse themselves any time soon.